My family has been enjoying Nature's Path products for a long time. One of the first organic cereals I can remember buying was the EnviroKidz and we still eat it today (yes I love the Cinnamon Jungle Munch!) So I was really excited to hear about Nature's Path's Que Pasa Chips and Salsa. 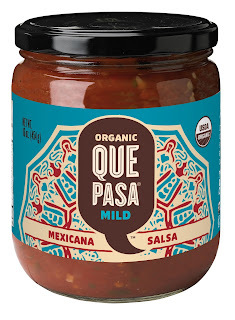 Que Pasa Chips and Salsa are always Organic, Gluten Free, Low Sodium, Whole Grain and Vegan. My favorite was definitely the Jalapeno & Lime, they were a but spicy, but the lime took away some of the heat, so it made them really good. Next, we have the Que Pasa Salsas which are available in 3 flavors, Medium, Mild and Chipotle. I really prefer the medium, but the kids inhaled the mild! I was so glad that this is a family favorite. I have been searching for a while for a good healthy snack that we could all share. You can find Nature's Path Que Pasa products at stores such as Whole Foods, Kroger, and Fred Meyer! There are many more stores too, check your area here! Be sure to follow Que Pasa for updates!